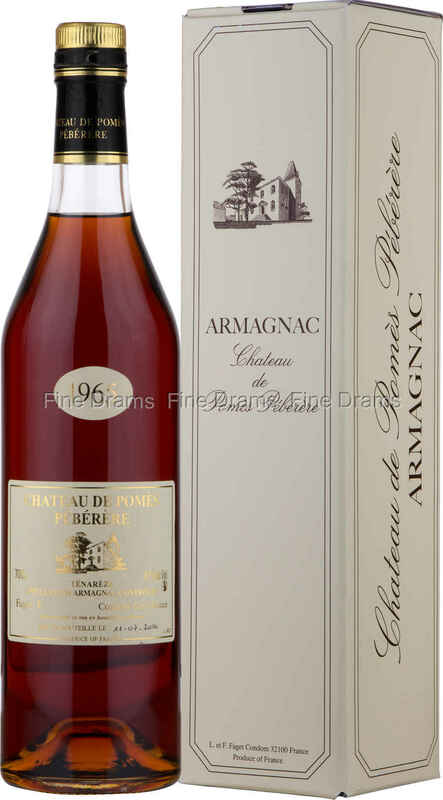 A fantastic vintage of Armagnac, produced by the small scale distillers Chateau de Pomes Peberere. This Domaine has vineyards of just under 100 acres, planted on a table top plateau of limestone and clay. They grow mostly Ugni-Blanc and Colombard grapes, also using a small quantity of other local grape varieties, most notably Gros Manseng. This use of several different grape strains creates a spirit of fantastic balance, with each grape working in harmony to provide flavour. Armagnac distilleries only release vintages when they truly believe that the spirit from that year’s harvest and distilling was something truly special. This is certainly the case for this Armagnac, which has sat in 400 litre French oak casks in the Chateau’s cellars for 50 years. An extraordinarily rich and densely flavoured spirit, the fruit and casks are in perfect union, with grape flavours and oaky vanilla balanced superbly. The finish is lingering, with highlights of chocolate, raisins and prunes. A rare and delicious vintage.